This musician played the violin while he was having a brain surgery. But why? This is by no means an eccentric fad, but a genuine feat of science. 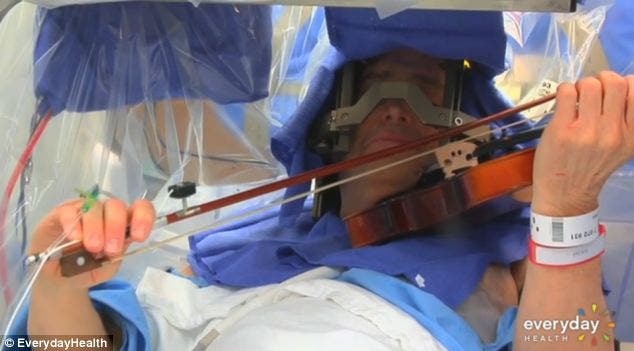 By playing the instrument during surgery, professional violinist Roger Frisch was able to guide his surgeons toward the segment of his brain which was misfiring, causing him to go into strange seizures, where his hands would go into an uncontrollable shaking. There is no direct cure for his condition. The surgery is called deep brain stimulation. It involves doctors placing a tiny electrode in the patient’s brain, through which they sent small electric impulses. They then asked him to play the guitar, an activity which often generates the seizures. Pretty soon, doctors were able to hone in on where the signal in the brain was sent erroneously, and implanted a tiny electrode right there. Now, whenever Frisch feels a tremor coming on, he simply has to push a button linked to that electrode, and the small area of the brain surrounding it is temporarily shut off, stopping the seizures. Frisch isn’t alone in his suffering; in the United States alone, over 10 million people suffer from essential tremors, which can range from mild to severe shaking. While in most cases, the tremors are fairly small and relatively manageable, in some cases, they affect even the most basic of daily activities, dramatically lowering the quality of life and even being dangerous. With Deep Brain Stimulation (DBS), the symptoms can be drastically minimized, but the technology is still in its early stages, and is highly invasive. But in time, it can be developed and have more widespread appplications. DBS also has potential applications in treating Parkinson tremors and has also been used to successfully treat epilepsy seizures in rats.